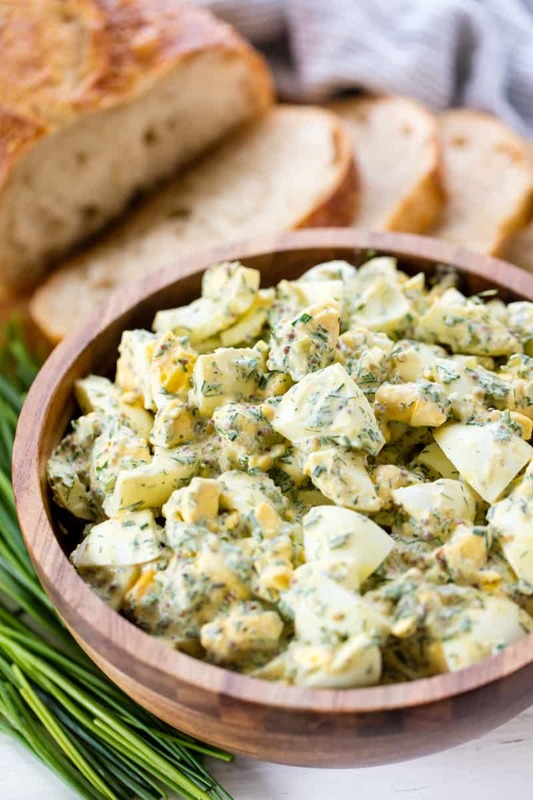 This Perfect Egg Salad recipe will knock your socks off! It’s the perfect balance of flavors and the secret ingredient? It makes all the difference. How Long is Egg Salad Good For In The Fridge? Egg salad is good in the refrigerator in a sealed container for 3 to 5 days. Remember though that egg salad is only good for 2 hours at room temperature. If your egg salad has been left out for 2 hours or more please do not save it in the fridge, just throw it away. Is eating egg salad good for you? Eating egg salad can be very healthy for you as long as you do not overeat. This recipe only has a little bit of mayonnaise in it making it a great low carb meal. Plus this recipe has high amounts of healthy fats, healthy proteins, and it tastes amazing! How do you make a perfect boiled egg that peels easily? Making the perfect boiled eggs is essential to a great egg salad. To get the perfect hard-boiled eggs, place eggs into the bottom of a medium-sized saucepan. Fill the pan with enough water to cover the eggs with 1 inch of water. Place saucepan over high heat and bring to a boil. Once it comes to a boil, turn off the heat, put a lid on the pan, and let sit for 8 minutes. 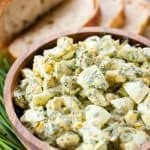 Can this egg salad be used for egg sandwiches? If you are looking for a great egg sandwich, this is the perfect egg salad for it! All you need to do is chop the eggs into smaller bits so the eggs will not fall out when you take a bite of the sandwich. If you are wanting to make a truly amazing egg sandwich use this recipe with my Homemade Rye Bread! What is the secret ingredient in this recipe? Horseradish is the secret ingredient in this recipe and it makes all the difference! It’s a small amount, just 1 tablespoon, and it adds a punch of flavor that you will absolutely love! 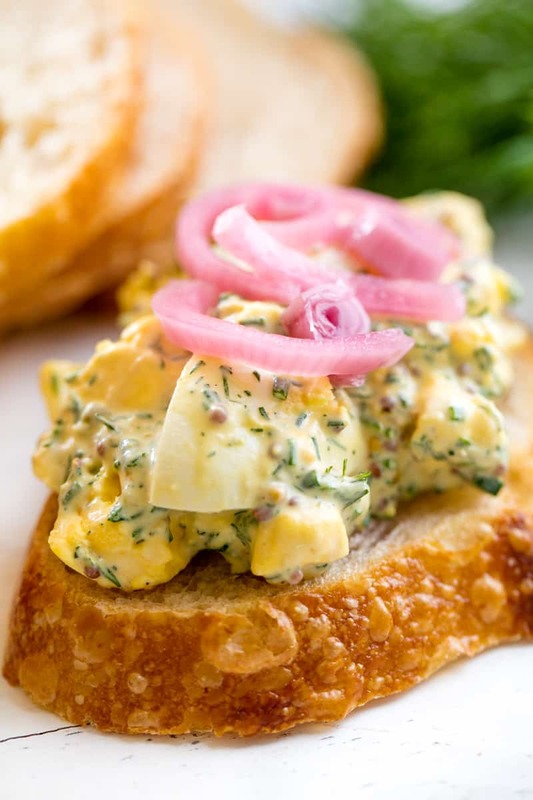 This Perfect Egg Salad recipe will knock your socks off! It's the perfect balance of flavors and the secret ingredient? It makes all the difference. Place eggs into the bottom of a medium-sized saucepan. Fill the pan with enough water to cover the eggs with 1 inch of water. Place saucepan over high heat and bring to a boil. Once it comes to a boil, turn of the heat, put a lid on the pan, and let sit for 8 minutes. Fill a bowl with ice and water. Plunge finished eggs into ice water to stop the cooking process. Peel eggs and chop into bite sized pieces. Place chopped eggs into a large mixing bowl. Add in mayonnaise, mustard, horseradish, relish, dill, and chives. Gently fold together. Chill until ready to serve. I absolutely LOVE your recipes!!! Will make this soon. Sounds delicious. I would like to use a little dill relish instead of sweet. I like your recipes. They are easy to make. Loved this recipe except (no horseradish for me) still lot’s of wonderful flavor; it’s a winner.